Upon arrival in New Zealand, my first order of business was to rid myself of my caffeine addiction. My reasons for doing so were simple: 1) at an average price of $4.50, it was no longer a habit I could afford and, 2) after 2+ years living in Italy, I had simply become a snob and assumed (rightly so) that Kiwi Coffee couldn’t meet my unreasonably high expectations. Note to readers: if you are interested in decreasing your caffeine consumption, and you’re used to 5+ shots of espresso per day, I do not recommend quitting cold turkey unless you are prepared to be a complete monster. Consider giving those you love advanced notice of your intent to quit, and it might be wise call in sick for a few days. Actually, don’t plan on leaving the house at all. You’re in no shape to be seen by the public. Anyway, after a week of constant headaches, unbearable mornings, ridiculous irritability and the incredible desire for naptime, I could finally say I was no longer an addict!! But every so often when I have a rough morning, I do splurge. It was on the first morning splurge that I encountered a new menu item, and it took a while to understand exactly what it is: the flat white. Found on every menu of every café or coffee stand in the country, a flat white is different than both a cappuccino and a latte. The Kiwi Cappuccino, and the American cappuccino for that matter, has a ton of foam. It’s a shot of espresso, a bit of steamed milk, and a massive amount of that fluffy, frothy, foam. So much that if you were to drop a sugar cube in your cappuccino, there would be a hole in your foam. Any Italian could tell you that this is not a proper cappuccino; how it devolved I have no idea, but I have never enjoyed this interpretation of a cappuccino. The bubbles just get lodged in your throat. A flat white is also different than a latte, which actually doesn’t exist in Italy. Latte simply means “milk,” so if you order one, you’ll get a big glass of warm milk. But in the Anglo-Saxon world, a latte is a shot of espresso which is then filled to the top with steamed milk, and it might have a dollop of foam on the top, just to be fancy. The flat white is a bit more complicated, for it takes into consideration the type of foam. None of this bubbly, airy cappuccino foam…no no no. 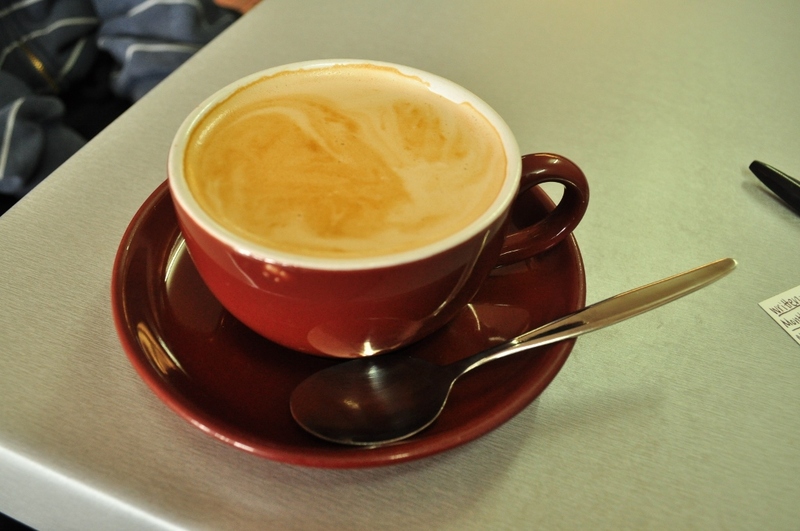 The Flat White is all about silky foam – much smoother and creamier than the frothy stuff. I’ve been instructed that technically, a flat white is one part espresso, one part steamed milk and one part silky foam. It is the closest thing I’ve found to a true Italian cappuccino. Now if I could only get the Kiwis to stop scalding the milk and burning the espresso, I would be in heaven…and I would likely become an addict once again! This entry was posted on December 13, 2013 by Katie. It was filed under Kiwi Word of the Day, New Zealand and was tagged with Flat White, Kiwi Dictionary, Kiwi slang, Kiwi Word of the Day, New Zealand Coffee, New Zealand slang, understanding Kiwis. You’re awesome, def following your blog.